With so many different methods of upholstery construction offered these days, it’s easy to understand why the myriad of options can be confusing to the consumer. Quality, comfort, price, and longevity are all key points most people look for when purchasing furniture. New technology and materials make it possible to have all of these important elements without emptying your pocketbook. Firstly, lets talk about framing and what distinguishes a quality foundation from that of a lesser quality. The best frame is made out of kiln-dried hardwood. The process of kiln drying removes all moisture from the wood, enabling it to retain its shape and stability over a long period of time. A frame made of green wood can shrink or crack. Knotted wood can also cause cracks. 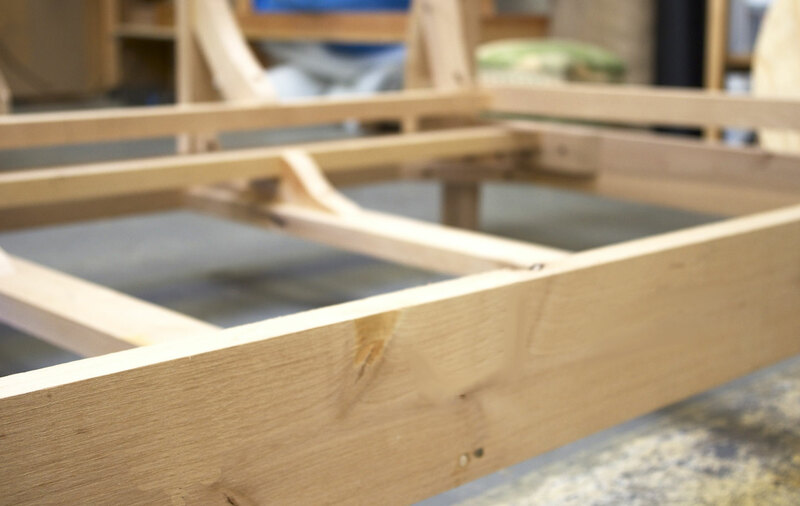 In a good quality frame, special attention is paid to the joints, which are glued, dwelled and screwed. The corners are further strengthened by the addition of reinforcing blocks, which provide extra support. Generally plywood and particle board frames are inferior, especially if they are held together with staples. However, additional layers of plywood may help reinforce the frame, so construction matters as much as material. A kiln-dried frame in the beginning steps of construction. While lots of upholstery may look similar in appearance, it’s what’s on the inside that matters. The belief that eight-way hand tied is the only way to go in high-end furniture, is an old-fashioned one that has been put to rest by hi-tech spring and web systems. While eight-way hand tied pieces remain to be a sign of quality craftsmanship and lasting power, they are no longer the only option in quality furniture. With this method, craftsmen connect each spring to the adjoining one with a strong twine. The twine passes front to back, side to side, and then diagonally in both directions thus tying each spring securely. Usually, one big factor is the cost of the piece upfront, as many hours of manual labor go into the process. Repairs on this type of suspension can also be pricey. Another method is sinuous spring construction. Sinuous springs are “S” shaped and run from the front of the seat to the back. These springs are supported by additional wires that cross from side to side. This also makes for a strong seat, and it might be the preferred option in a sleeker style as it requires less space. 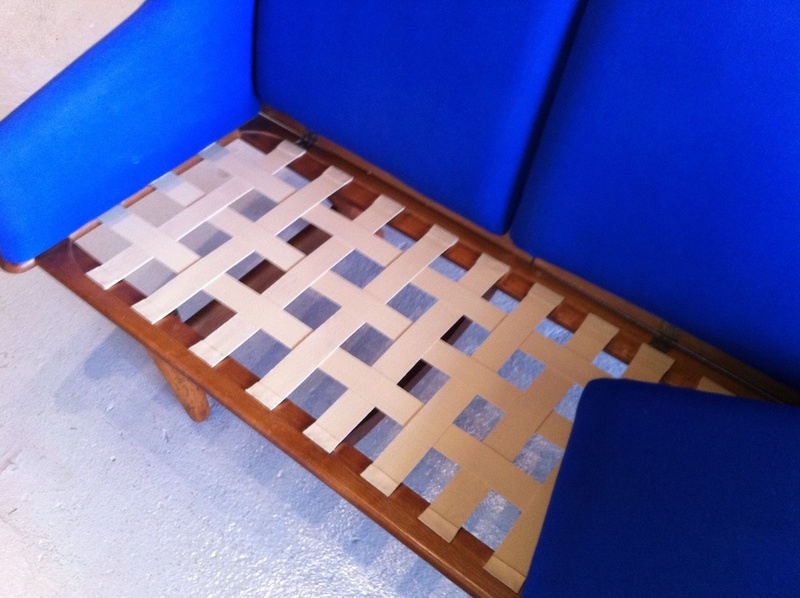 The third option is web suspension in which bands of webbing cross the seat and back. These then attached to the frame to make a platform for the cushions. Webbing can be made of either natural or man-made fibers, and if used alone doesn’t make for very strong support. However, in high quality sofas, superior webbing has been developed that combines the lasting power of hand-tied with the space-saving attribute of springs. The most superior webbing, Pirelli webbing, is made from a highly resilient material that is used in the construction of airplanes and automobiles. Pirelli webbing on a sofa deck. Now it’s time to look at what kind of filling is used for the cushions. If you want a really soft seat then consider down cushions. As you might imagine, they are among the most expensive of options. 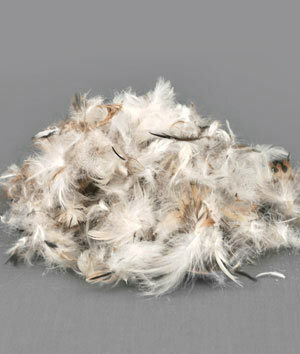 High quality cushions will have down proof ticking under the upholstery fabric to prevent feathers from poking through. Be warned that cushions filled just with down are very high maintenance requiring daily attention. Trillium, a new introduction on the market, combines downs softness with the ability to spring back into shape. It is also a hypoallergenic option for those with a down allergy. Down used in combination with other materials is also a good option. Pads made out of a Dacron polyester fiber and down, are wrapped around high density foam. This offers a softer seat while keeping the down from settling in the bottom of the cushions. These pads can also be used with springs that have been wrapped up in foam. High density foam surround the springs that are then wrapped in down pads. The result is a soft surface with a strong, resilient support inside. This is a good option as the cushions do not lose their shape easily. The most common filling is high density polyurethane. Obviously, the higher the density, the cushion will be. Make sure that you are getting high density foam, as lower quality foam can start breaking down quickly. With the countless combination of options available, there’s a sofa for every budget and comfort level. Next week, we will discuss the different upholstery methods used and how application differs depending on the style of the piece.